The place to play on the northern Pacific Coast. The Hacienda Pinilla Golf Course is spread over 4,500 acres along the north Pacific coast of Costa Rica. This rolling coastal landscape served as a cattle ranch for more than 40 years, giving the resort its unique “Ranch-like” ambiance, rustic yet elegant. This amazing property offers the visitor three miles of pristine beaches with delightful ocean views. A tropical dry forest offers a diversity of habitats with nature trails for exploring. Ancient and majestic native trees such as the “Guanacaste”, “Matapalo” and “Pochote” provide habitat for a myriad of colorful species of birds, iguanas, monkeys and deer, and others. In tune with the environment, this beautiful championship golf course is ecologically-friendly and has been certified by The Audubon Society. One of the few courses in the world facing the sea and to have “Tif Eagle Turf” on the greens, golfing here is truly an incredible experience. As a reward for successful approach shots, the Tif Eagle greens guarantee each putt a consistently smooth ride right down to the center of the hole. 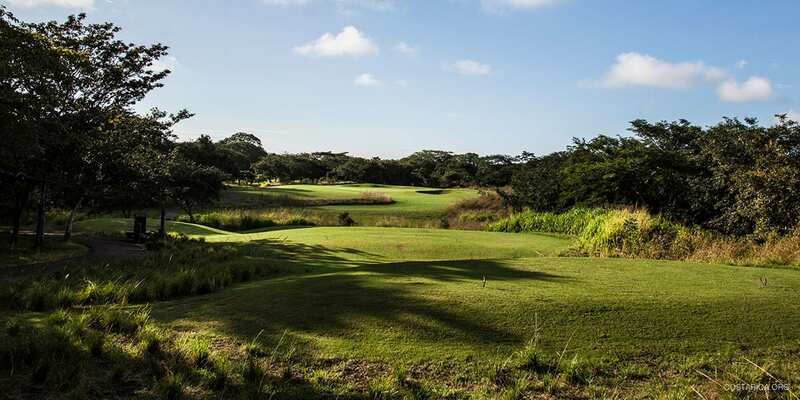 This magnificent golf course rewards golfers with a most enjoyable round of exciting golf. The different risk/reward situations offer different challenges in every round. It is also infinitely playable, where six sets of tees are set up at the beginning of each hole to account for all levels of players. The perfectly manicured fairways of Hacienda Pinilla are generously wide and lush. However, dozens of links-style bunkers present attractive and challenging obstacles. An amazing variety of exotic trees is spread throughout the course serving as natural hazards, as well providing hangouts for tropical parrots, iguanas, and deer. You will love the stunning areas around Hacienda Pinilla. The Pacific Coast of Costa Rica is full of amazing beaches and places to visit. One of the best places you should take a look at in Tamarindo Beach. You will be surrounded by cool views amazing biodiversity and endless things to do.